What a beautiful story. You truly are an inspiration, Melissa! This marathon will be my first (at age 51). I will think of your strength and determination during the marathon, and use it to see me to the finish line. Best of luck to you on May 5th! Hi Julie. I know many people have a story; it is my hope to give many like yourself inspiration. I admire you for taking on this challenge at age 51 for the first time. In everything we do I think, “attitude is half the battle”. Run strong and best of luck to you too! You are so right about attitude being half the battle. Thanks, Melissa! What an inspiration!!! It will be great knowing you are out there this year! Well done! Melissa, YOU are an inspiration! I feel blessed to know you & your story motivates me! Be blessed & I know you will give it your all!! Melissa…you are the perfect person to be on this banner! God bless and thanks for motivating so many of us! Melissa, Congrats on this wonderful story. We are so proud and lucky to have you as our instructor/trainer and friend. We continue to admire the dedication and energy you bring to every class. You constantly raise the bar and challenge us to work hard and to be strong. You do all this with a beautiful smile and positive attitude too…You truly are exceptional! What a wonderful story. You truly are an inspiration to all of us Melissa! We love you Meliss! You’re definately an inspiration to us all! AWESOME!!!! I am so excited for you to be “up and running” this year. My best friend just spent 2012 getting diagnosed, having a double mast. and going through chemo and reconstruction all at the age of 36 having just had a baby 6 months prior. It really threw me for a loop. You see my hubby died in 1999 (melanoma) when i was just 25 and I hadn’t had anyone that close to me diagnosed until her diagnosis. It brought back so many emotions. But I knew she’d beat it. I continued running and training for the NYC Marathon (which of course didn’t happen because of Sandy) as i raised money for StupidCancer.org. Running brought me back to life after my tragic loss. And I wanted to do what i could to honor her. I ended up running the Philly marathon last november and when I battled mile 23 i thought of her chemo and bone pain and painful removal of drains and feeling so beaten down and it gave me the strength to say “i am healthy and i am strong and I will not stop until I cross that finish”. I did! And I PR’ed. I broke the 5 hour mark (4:57). I’ll be running NJ this May. 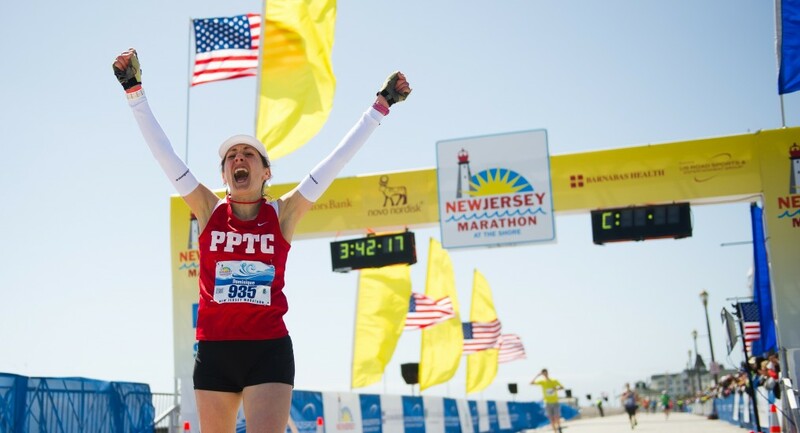 I wish you continued health and beautiful running-filled days…..I’m so grateful to the NJ marathon organization for sharing this story with everyone. Hello Sally…….Thank you for sharing your story also. Through everything I have found much comfort in talking with people. It gives us all an opportunity to vent. Nothing is easy when it comes to the loss of a loved one or the diagnosis of cancer. I consider us fortunate to be able to express our feelings through running, a way that is so truly empowering. Continue to build strength and stay strong……wishing you the best this May. p.s. tell your friend attitude is half the battle! I wish her great health in the years to come.